In July of 2008 my brother in law was visiting with his family and looking at the progress of my layout thus far when he made some comment to the effect that "I wonder why all the layouts that I see have no turns in them?" Now I don't know what layouts he was talking about since most layouts have too many turns. But I took it as a thinly veiled reference to my layout; yet I still managed to hold my tongue. However, the incident spurred me to start the first section of the three tracks up Cranberry grade with a projected completion date of before Christmas. Cranberry grade is along the right wall as seen in the track plan. This section would involve building four new benchwork sections and laying out two 90 degree curves and two S-curves. The radii of the curves on Cranberry are 64", 68.5" and 73". They were originally intended to be 64", 68" and 72" , but when I adopted Atlas switches in the M&K Junction area, I had to adopt their 4.5" center-to-center track spacing. These curves will handle big B&O steam like the EM-1 2-8-8-4 and the S1 2-10-2. The curves were laid out using a homemade beam compass. At one end of the beam that I made for the beam compass are holes to hold a pencil to draw: the center line of the track; the limit of the roadbed on both sides of the center line; and the limit of the sub roadbed cutout on both sides of the center line. On the other end of the compass beam, and measured from the pencil hole representing the center line of the track, I have holes at 64", 68.5" and 73" that accept the pivot nail on the center column of the beam compass. Using this beam I could draw the five lines representing he 64" radius curve, move the pivot nail to the 68.5" hole and draw those five lines and finally lay out the 73" radius curves in a similar manner. 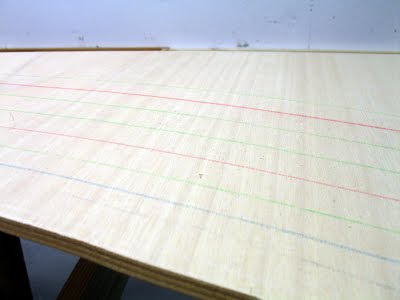 By using a red pencil for the center line, green for the edge of the roadbed and blue for the 'cut-to' line at the edge of the sub roadbed the lines drawn on the plywood sub roadbed do not get too confusing. The picture that follows shows the guidelines laid out for two parallel curved tracks. The beam compass was aligned square to the tangent (straight) track at the point where the curve was to begin (the Point of Tangency (PT)) then the pivot point of the compass was offset about 3/4 to 1 inch towards the inside of the curve to provide for an offset for an easement. Once positioned to my satisfaction, the pivot point of the beam compass was not moved until all curves in that location were laid out. This kept all curves concentric. I lay out my curves while the plywood sub roadbed is still flat. All of my curves are eased. I initially tried to lay out easements using a cardboard template actually calculated using the cubic spiral formula. However, even in O scale the offsets calculated using the cubic spiral formula were so small that I worried that the effect on trains would be minimal. So I reverted to using a batten (a thin, narrow strip of wood) to lay out the easements. Once all of the curves and easements are laid out, I take the plywood sub roadbed outside and cut to the blue lines, which represent the edge of the sub roadbed. Doing the cutting outside eliminates sawdust in the basement. Once the plywood is back on the benchwork, I begin adjusting the risers to the grade, if any. Here is the track at the start of Cranberry grade. These tracks are on a 1/2 percent grade which will increase to 2 percent to the left of this scene. After this first 90 degree curve in the corner of the basement, I had to begin the back-to-back 'S' curves along the short wall of the basement (right hand side in the trackplan). Why such a complicated track arrangement? Because photographs, track diagrams and personal on-the-ground inspection show that there is little straight track on Cranberry Grade, and S-curves are common. A secondary, but very important, reason is to have a scenic attraction at this spot on the layout. 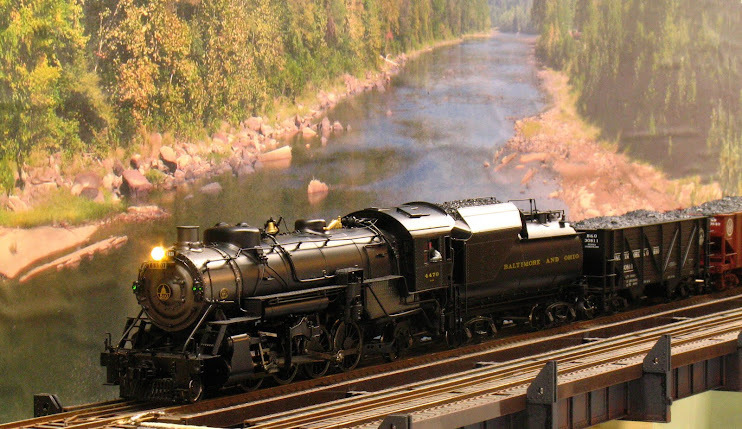 Now S-curves are supposed to be one of the toughest things to do on a model railroad; therefore I proceeded very deliberately. I used the guidelines in John Armstrong's "Track Planning for Realistic Operation" and laid out generous easements into and out of the 'S'. Armstrong reccommends that every S-curve have a section of straight at its center at least as long as the maximum truck center spacing of your longest rolling stock; in my case 85' passenger cars. But generous easements and long straightaways left little of the sinuous 'S' curvature that would be a scenic attraction. So I minimized the central straightaway as much as I believed that I could get away with. To make sure it would work with the minimal straight sectgion I laid the flextrack on the plywood first and tested each S-curve on all three tracks with a passenger car coupled to a 30' hopper to accentuate the offsets of the couplers (per John Armstrong) to avoid a mistake that would be difficult to correct later. The train is moving up a 2% grade and rises about 10 inches moving along this section of track.